and "Unconditional Love." With an enjoyer's attitude of openness, acceptance and positivism, a unique way can be established to connect us to our true nature of truth and freedom, awareness and blissfulness. With consistent enthusiasm and self-effort, we can start to gain strength in our connection. Then we can consistently energize ourselves and co-create all our aspirations; including those of fulfilling relationships and authentic communications; in conjunction with the Universal or Supreme Energy. There are five elements that spontaneously trigger the Real Connector and the Enjoyer in a person. Including the arena of authentic communications and relationship skills. This simply means understanding and cultivating the following attitudinal qualities to connect and enjoy in our life as an ongoing basis in all walks of our lives. (i) Acceptance is recognizing in a mode of awareness (i.e. Self) the reality as it is, and coming to grips with it. This is accepting the self as you are, family as it is, others as they are and the situations as they are. It helps us to consistently grow with self-love, peace, confidence, compassion and patience with oneself and with others. It grounds and centers us, and gives energy and freedom from fear which in turn gives us an overall satisfaction with life. It makes family, friends and other interacting persons feel secure, radiate joy and energy, remain united and grow together. It acts as a door to renewed mind, unity in purpose and changed life, a feeling of wholeness and often, an expanded awareness. As such, an understanding of acceptance in full and deciding to cultivate it, is absolutely essential. (ii) Openness implies being free from any preconceived notions or barriers. It is not being closed minded, obstinate, or stubborn about a viewpoint. Although it is a tremendous quality, it must be used with full awareness (i.e. Self). It must then empower us by establishing ourselves in a mode of truthfulness and operating from that powerful mode. Committing to take time everyday to cultivate openness and offer that openness to everyone we meet in our interactions with them is an essential ingredient of authentic communications and relationship skills. (iii) Positivism is the state in which we are positive. By being positive we are effective, real and active in all aspects of life: as economic, social, political and spiritual. Practice by offsetting others negativity first, by being fully positive ourselves, and then sending our positive vibrations to the negative persons or negative situations. In this state we must refrain from retaliation. Using our inner peace, love, compassion, harmlessness and patience to offset others states of disturbances and dislikes or hatred is the best approach. Practice more to listen to our inner voice (in our inner silence) and responding to all situations from that mode. (iv) Present Moment Presence (PMP): At this juncture, it's important to remember that we also need to understand and practice the qualities of the present moment presence and joyfulness/blissfulness. PMP is being one with the moment and being one with the person and situation that we are interacting with. This practice requires focusing (paying undivided attention) on us individually, the people we are interacting with and the activities we are performing in the moment. (v) Letting Go of attachment to the outcome of all the actions performed in the above mentioned connected ways, gives us our inherent freedom. It also is a clear action of our trust and co-partnership with the One that orchestrates the dance of the whole universe. We can practice "Letting Go" beginning our day with this statement, "Today I will participate in everything with detached involvement" and remind myself throughout the day to remain aware as such. All inner toxins and other obstructions that stand in the way of our authentic communications and relationship skills automatically start to disappear when the individual attention is regularly focused on the most powerful purifier, the Higher Self. The person begins to flow spontaneously with this purification in humble, polite and joyful ways. In this experience, the whole personality starts to unfold itself to complete new dimensions of the Self and the Supreme Self that pervades all at all times. This is the beginning of a new life for this person, and its in this state the whole world we live in starts to offer its splendors spontaneously and effortlessly. It is setting the stage for flying with joy in all walks of life, and our authenticity, clarity and simplicity in our communications and relationships will begin to radiate effortlessly. Of course, balancing of female and male energies becomes a focal point in our current theme, and its the radiance of the Being that brings spontaneity (with the least effort) in all our interactions as a joyful bundle of human experiences. The peaks and valleys of our relationships become smoothened out along with our communications skills refined as such. 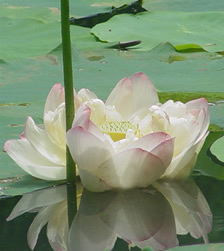 In our own silence/peace we; as the valuable members of the universe; let us observe how we are doing about the development of the above mentioned skills and there utilization in the day to day living of our lives, and if directed from within, having dialogues with co-members for further refinements and growths, let's please hear from you.